The earliest available Prerogative Court of Canterbury will probate for a Southwark resident with the Raymond surname is the 1682 will of Mary Raymond, a widow of Saint Olave, located just east of London Bridge. Next is that 1749 will of Ann Raymond a widow of Saint John and the later that same year will of Thomas Raymond a Linen Draper of Saint Saviour 24. A compilation of indexes and abstracts of pre-1858 Archdeaconry Court of Surrey proven wills is available but at the time of compilation had not been consulted 29. Nothing in any of the three sighted wills links a testator or beneficiary definitely to the Raymond family whose history and genealogy is the subject of this article. At the time of compilation in 2007 the International Genealogical index (IGI) had the first Southwark church Raymond surname baptism as an Anne Raymond on 31 May 1705 at Saint Olave whose parents were John & Anne 1, 4. The couple also had a son Michael baptised there on 17 Sep 1712 who was possibly the Michael who was the son of the Ann mentioned in the above linked to 1749 Ann Raymond will 1. Their father John is presumed to have been born about 1680. Perhaps he was a brother of a William Raymond of St. Saviour's, by occupation a dyer, who was mentioned in the record of a 1726 distribution to his wife Hannah nee Gatland and her siblings of the proceeds of the sale of land at Cuckfield known as "Davyes Mead" (in Middle English "Mead" meant a meadow)? Her mother Hannah Gatland (1689- ) was a daughter of Edward Gatland (1647-1710) and Hannah Wheeler and her ancestry in Cuckfield traces back to Thomas and Susan Gatfield whose first child Edward was born there ca. 1591 22. Whilst not established whether any of the above named persons are relevant to the genealogy of this Southwark Raymond family, as a starting point for the genealogy it has been assumed the above mentioned presumed ca. 1680 born John Raymond and wife his Anne had in addition to the mentioned 1705 and 1712 St. Olave church baptised children a son likely named John, and that he in turn had a son named John who was born ca. 1731 who was perhaps the John Raymond baptised at Stepney in 1731 herein identified as John Raymond I who had a mariner father named John (see below chart). As depicted in chart below John Raymond I married Rebecca. He is at least by name, regardless of his speculated upon parentage and birth year, the known progenitor of this Raymond family of Southwark. 1. John Raymond I, presumed born ca. 1731, possible parents John Raymond (a mariner) and Elizabeth who had a son named John baptised at St. George in the East, Stepney on 7 Apr 1731 1. He married Rebecca (surname unknown). Lighterman apprenticeships usually began at fourteen years of age and lasted for seven years. The circa 1731 birth year given here for John Raymond I is based on the assumption he was the John Raymond listed in the Honourable Company of Watermen and Lightermen lighterman apprenticeship binding records as apprenticed on 17 May 1745 to Thomas Gardener at St. Katherine's, situated on the north bank of the river Thames adjacent to the Tower of London, and that he was aged fourteen when it commenced 2. If fourteen at commencement he would normally have completed the apprenticeship at twenty-one and become a freeman in 1752. However the binding record gave no date of completion indicating he must have abandoned the appenticeship before completion and thereafter followed another occupation. The father's occupation given in the baptism register entries for John and Rebecca's proven 1758 born son John and 1762 born son Thomas are consistent with an abandonment of the appenticeship. It could have occurred for as simple a reason as a desire to marry that would not have been possible whilst still an apprentice. Thereafter it would be expected he would have worked in a non-tradesman occupation still in some way associated with the river Thames. Lighters in charge of licenced lightermen were the means by which coal was transported to and from ships. As the coal industry rapidly developed in the 18th century Bankside at Southwark with its near access to London Bridge became one of the major sites from which the distribution was handled. From the middle years of the century the coal-wharves began to shift there - the Rocque map of 1746 marks several. The baptism record of son John had his father's occupation as "porter". Likely he was a "coal porter" noted defined as "a person responsible for measuring & filling two cwt. sacks of coal from ship, barge or quarryside & loading coal merchants wagons". Four years later in 1762 when their second known child Thomas was baptised it was given as "coal heaver" defined as "a man employed in carrying coal, and esp. in putting it in, and discharging it from, ships". Thus it can be assumed after the presumed abandonment of the apprenticeship John Raymond I would have worked as a labourer for a Bankside lighterman who was also a coal merchant. As the lighterman occupation often ran in families for several generations it is not unexpected to find that John's two known sons began their working lives similarly apprenticed to the trade, albeit not to their father as master as he had not completed the necessary apprenticeship to become a licensed lighterman, but to others who were. The St. Saviour's church at Southwark baptism register for 1730-1731 had no John Raymond baptism 25. Based on a probability John Raymond I was born on the north side of the river, not far from St. Katherine's where apprenticed in 1745, he may well have been the John Raymond recorded in the IGI as baptised at St. George in the East, Stepney on 7 Apr 1731 followed by a sister Ann baptised there on 20 Apr 1733 1. On both occassions the parents were identically recorded in the register as John and Eliz. (likely abbreviated from Elizabeth rather than Eliza), of Marsh Yd. (i.e. Marsh Yard), and their father's occupation was Marn (the abbreviation for Mariner) 25. However no probated will has been identified for John Raymond the mariner that might have proven his 1731 born son John and John Raymond I were one and the same person. While John Raymond I failed to complete a lighterman apprenticeship others of the Raymond surname, who in a yet to be determined way may be related to this Raymond family, were noted in the apprenticeship bindings indexes as having been master lightermen (or in some cases their widows) with apprentices bound to them in the following years - in 1744 Dutton Raymond, 1755-1770 Sarah Raymond, 1760-1771 Thomas Raymond, 1778 Abraham Raymond, Elizabeth Raymond 1787-1802, John Raymond 1814-1875. A William Raymond born at Rotherhithe in 1747 completed a lighterman apprenticeship in 1770 but seemingly is unlikely to have been a sibling of 1758 born John and 1762 born Thomas as his 1847 birth would have been too early. Also unlikely is that this William was the same William Raymond of Richmond who seemingly had a son William who was also a lighterman at Richmond. As London and suburban church parish records become more accessable the determination of other possible relationships will become easier. 2. John Raymond II, baptised 14 May 1758 3, 25 at St. Saviour's, Southwark, Surrey, England, son of John Raymond and Rebecca (surname unknown). He married on 16 Mar 1779 at St. Giles, Camberwell, Ann Mead, daughter of Joseph Mead (- ca. 1797) and Dorothy. The 1758 baptism of John Raymond II was not listed in the current in 2008 IGI most probably because the "bishop's transcript" of the original parish register from which the entries were extracted was too faint to be readable. However his baptism entry was readable in the original St. Saviour's Church (since 1905 Southwark Cathedral) register held in the vault at the London Metropolitan Archives (LMA). It had his parent's names as John and Rebecca and his father's occupation as porter 25. The witnesses to the 1779 marriage of John to Ann Mead were recorded in the parish register as George Hawes and Dorothy Mead. Dorothy would have been Ann's sister Dorothy or her mother also a Dorothy. It may be there was a family relationship to the other witness George Hawes, as 40 years later in 1819 an Old Bailey court case establishes that sons John and Mead then had a business relationship with soap manufacturers Thomas and Benjamin Hawes who perhaps were sons of George Hawes? Sixteen years after the marriage John and Ann's eldest son Thomas was apprenticed at Southwark as a lighterman to his grandfather Joseph Mead who died in late 1796 or early 1797. Joseph's seven and a half page will (as transcribed into the record book) was dated 31 Jan 1791 and was probated in the Prerogative Court of Canterbury on 6 March 1797. It had his occupation as coal merchant and address as Bankside at Southwark. Named as the beneficaries were wife Dorothy and six daughters viz. - Dorothy White (wife of Thomas White of Bankside), Sarah Easton (wife of Thomas Easton of Bankside), Ann Raymond (wife of John Raymond), Margaret Terry (wife of Thomas Terry of Bankside) and then unmarried daughters Mary and Rebecca. Perhaps suggesting John Raymond II may have been deceased by the 1791 will date is a reference in it to daughter Ann and husband John Raymond as being - "late of ... Bankside". That differed from the specific locality of Bankside given as the address for each of the other three married daughters and their husbands. On the other hand if John was deceased by 1791 it seems likely Ann would have been described in the will as the "widow" of John Raymond rather than as his "wife". So perhaps the "late of Bankside" was given because John and Ann had recently moved and Ann's father at the time of making the will was unsure of their new address or regarded it as only temporary? In the extractions to the IGI of the St. Saviour's baptism records John and Ann were listed as the parents of a 1782 christened Ann. No parent names were given in the extractions of the 1783 and 1785 St. Saviour' christenings of her siblings John and Mead. However the original baptism register held at the London Metropolitan Archives (LMA) recorded them as John and Ann and gave the father's occupation as lighterman 25. Not listed in the IGI, but whose baptism was readable in the original register, was that of their first born child Thomas baptised at St. Saviour's in 1781 3, 25. The lighterman occupation of the father, given in the register entries for all three sons, leaves no doubt he was 1758 born John as prior to their births he was the only John Raymond recorded as completing a lighterman apprenticeship. On 14 August 1772 when aged 14 years John Raymond II was apprenticed as a lighterman to Emanual Thornbury at Southwark and completed the seven year apprenticeship on 19 Aug 1779 2. His successful completion of an apprenticship marked the first step up the social ladder for the family out of the labouring classes - an upward movement further continued in the next century when descendants entered the professions of law, engineering and the military. Explaining how it was that two decades later when sons Thomas, John, and Mead were respectively apprenticed as lightermen in 1795, 1798 and 1800 it was not to their father as master but to others, might be perhaps that during those years John II was either employed by another, had retired from the vocation as a result of injury, or he was deceased. The only lighterman apprentices recorded bound to him as master were his 1762 born brother Thomas Raymond on 21 Oct 1779 by way of a reassignment and a Godfrey Benjamin on 24 May 1781 at St. Saviours who completed his apprenticeship on 12 Jun 1788. Post the latter date John Raymond II's history is unknown. The John Raymond listed at No. 13, Bankside, Southwark in a 1811 London directory would have been either him or 1783 born son John Jr. who married that year and had completed his apprecticeship in 1805 5. 3. Thomas Raymond, baptised St. Saviour's, Southwark, Surrey, England, 1 August 1762 3, 25, son of John Raymond and Rebecca (surname unknown). His line has not been researched. Thomas's baptism was not listed in the current in 2007 IGI and was completely invisible on the microfilm of the original baptism register. However it was readable in the original bound-vellum baptism register from which the microfilm was made that is held in the LMA strongroom. It gave his father John's occupation as a coal heaver 25. Thomas was bound as an apprentice lighterman at Southwark to Thomas Lowethorpe as master on 13 Feb 1777 when aged 14 years and six months. The apprenticeship was reassigned to James Hays on 28 Jan 1779 and again reassigned on 21 Oct 1779 to John Raymond 2. No apprenticeship completion date is available from the record but if Thomas did complete the apprenticeship the year would likely have been 1784. His last master was seemingly his 1758 born brother John who had completed his own apprenticeship and became a freeman of the Company of Watermen and Lightermen only two months before the reassignment. Nothing further is known of Thomas. Perhaps he was the Thomas Raymond who married an Ann Overey at St. Mary, Rotherhithe by banns on 6 Aug 1799 1 ? 4. Thomas Raymond, son of John Raymond and Ann Mead, was christened 14 Jan 1781 3, 25 at St. Saviours's Church, Southwark, Surrey. England. He was apprenticed as lighterman on 12 Feb 1795 at St. Mary Overy at Southwark to his grandfather Joseph Mead who was a licenced lighterman and coal merchant who died two years later. No record has been noted of Thomas completing the lighterman apprenceship under another master. He may have been the Thomas Raymond who married Elizabeth Fisher at St. Saviour's in 1815 or the Thomas Raymond who married Ann Pudney there in 1833 1, 6. There was a Thomas Raymond a tobacconist of 125 Cheapside, whose death on 20 Dec 1846 at age 65 at his residence at No. 2, Angel-terrace, Pentonville was recorded in "The Times" of 22 Dec 1846, and whose 27 Jan 1847 probated will is held by the National Archives. However as 65 at death means he was born after 20 Dec 1780 it seems unlikely he was this Thomas who was baptised only three weeks later on 14 Jan. '81. His father seems more likely to have been James Raymond, tobacconist of Cheapside, whose will was probated on 8 Oct 1810 and who was listed in the 1808 Post Office London Directory as J. Raymond, tobacconist, 125 Cheapside. An outside chance is that James was a brother of 1758 born John and 1762 born Thomas, who having no son of his own had taken nephew Thomas into his tobacconist business at Cheapside after Thomas had given away the lighterman apprenticeship commenced in 1795. No doubt the 1810 will of James would clarify the status of Thomas as either his son or nephew. 5. Ann Raymond, daughter of John Raymond and Ann Mead, was christened 2 Jun 1782 1 at Saint Saviour's Church, Southwark, Surrey, England. 6. John Raymond III, son of John Raymond and Ann Mead, was christened 23 Nov 1783 1, 25 at St. Saviour's Church (since 1905 Southwark Cathedral), Southwark, Surrey, England. He died aged 66 years in May 1850 at St. Saviours Church Yard; buried 23 May 1850 8, 9 at St. Saviour's, Southwark. He married on 9 May 1811 1, as recorded in the register with her father's consent, at St. Saviour's Church, Southwark, Surrey, Elizabeth Chapman, born 26 Oct 1790 and christened 21 Nov 1790 1 in Saint Olave, Southwark, Surrey, England; died in her 39th year on 27 Jan 1829 10; buried 4 Feb 1829 9 at St. Saviour's, daughter of William Chapman 11 and Ann (her surname is unknown - it possibly was Terry) sister of his brother Mead's wife Ann Chapman. The apprenticeship binding records of the Company of Watermen & Lightermen record John Raymond III was apprenticed as a lighterman on 8 Feb 1798 at Horslydown, Southwark to Thomas Bowen and he completed the apprenticeship on 28 Feb 1805 2. When giving evidence in 1819 at the Old Bailey in a case against an employee accused of stealing his brother Mead named John as his partner in their business as wharfingers and lightermen (wharf owners or operators and transporters of cargo to and from ships) that had its counting-house in Clink Street at Bankside, Southwark. Clink was the term for a latch or other fastening device. The street name and the usage of "Clink" as the slang term for a gaol originated from a goal that was located at Bankside from the 12th century and today a small museum in the street commemorates its' once existance. Of the two bothers, the first recorded in the apprenticeship bindings records of the Company of Watermen and Lightermen as having had an apprentice bound to him was Mead, to whom a Thomas Kingman was bound at Bankside on 10 Aug 1809 who completed the apprenticeship on 10 Apr 1817. The next was also bound to Mead - a William Meckiff bound at Bankside on 17 Mar 1814 who completed his apprenticeship on 28 Jun 1821. He was followed by Robert Foot, the successful defendant in the above mentioned and linked to Old Bailey criminal prosecution case, who was apprenticed to both at Bankside on 22 Dec 1814 and completed his apprenticeship 4 Apr 1822. A Sun Fire Office insurance policy created on 2 June 1819 indicates part of the partnership's leased premises in Clink Street, described in the policy as "Raymond's Granary near the Bridge, Bankside", was sub-leased to another party 12. In 1823 the wharf and wharehouses were described in a newspaper for sale advertisement as - "extensive and capital brick-built Stacks of Wharehouses and Granaries, of 4 floors, 63 feet in front of the Thames, and 45 feet deep in Clink-street, in occupation of Messrs. John and Mead Raymond. The premises are well timbered and capable of receiving upwards of 2,000 quarters of corn, on lease which expires in 1830, at 168£. per annum". Additional adjoining or nearby part-premises were described as - "capital brick-built Stacks of Hop Wharehouses ... in Clink-street, 4 stories in height, and strongly timbered : together with a stack of wharehouses in the rear, and opening on to Winchester-yard, forming together 3 stacks standing upon a site of ground, 55 feet 8 in. in front of Clink-street by a depth of 81 feet, in the occupation of Messrs. Young, Needham, Goudge and Thrupp, and Raymond, at rents amounting to 249£. 10s. per annum" 13. The London Metropolitan Archives (LMA) holds a plan on an original deed of a 1804 - 1815 lease of the wharf, wharehouse etc., when the freeholder was named Hammond, and for at least the latter part of the 17-year lease period the lessee was the John & Mead Raymond partnership 23. The business was first noted in a 1811 London commercial directory listed as - John Raymond, lighterman, 13 Bankside, Southwark 5. As John Jr. only completed his apprenticeship in 1805 this listing may possibly have been his 1758 born father who was also a licenced lighterman. By 1814 at the same addres it had become J & M Raymonds and by 1820 J & M Raymond, cornfactors and lightermen, Clink Street, Southwark 5. In the 1825 Pigot & Co. London Trade Directory the partnership was listed as RAYMOND Jn. & MEAD, Clink-street, Borough of Southwark. In that directory John Raymond was separately listed as residing at 15 St. Saviour's, Church-yard, Borough, located along the southern boundary of St. Saviour's Churchyard only a short walk from the partnership's Clink Street business premises, where he was to remain residing for the rest of his life. By 1839, and perhaps from a little earlier about the time their eldest sons came of age, it is apparent the John & Mead Raymond partnership was dissolved with each brother thereafter operating their own family business. The 1839 Pigot's Trade Directory listed RAYMOND, JOHN, wharfinger, lighterman & granary keeper, Horseshoe Wharf, Clink St, Borough. The 1846 Post Office London Directory listed same but with the business name changed by way of the addition of the word "son" to - RAYMOND, JOHN & SON, lightermen, wharfingers, & granary keepers, Horseshoe Sufferance Wharf, Clink-st. Confirming by 1839 the partnership had been dissolved is that Mead's 1840 executed will devised only "his" business at Raymond's Wharf, Rotherhithe. It was listed in the commercial section of the 1846 London Post Office Directory as RAYMOND, MEAD & CO., boat & barge builders, wharfingers & lightermen, Raymond's Wharf, 50 Rotherhithe Street 14. In 1840 John was the Master of the Company of Watermen & Lightermen founded ca. 1700 that administered the River Thames passenger and cargo transport industry and the apprenticeship scheme. In 1859 his eldest son William followed in his footsteps by also serving as Master of the Company. The 1846 Post Office London Directory, the same as had the 1825 Pigot's directory, listed him as a "lighterman, etc." residing at 15 St. Saviours' churchyard. In the 1841 census his residence was given as Church Yard, St. Saviour, Southwark with the others in the household being lightermen sons William and Alfred Mead and two female domestic servants. His will dated 4 April 1848 was probated in the Prerogative Court of Canterbury on 24 July 1850. In addition to bequests to his three sons he bequeathed the sum of nineteen pounds and nine shillings each to servant Martha Rogers, then aged 22, and two male servants. London directories from 1850 to 1855 carried a listing of John Raymond & Son, lightermen, Horseshoe Sufferance Wharf, Clink Street, Bankside 5. Of John's three sons only William carried on the River Thames lighterman and granary business with John becoming a barrister and Alfred a corn factor in the City of London. The 1861 census listed William's occupation as Granary Keeper and Lighterman. The Company of Waterman & Lighterman bindings index last listed him as taking on an apprentice on 9 Oct 1866 at Bermondsey 2 and a year before he died the 1871 census listed him just as a Granary Keeper. 7. 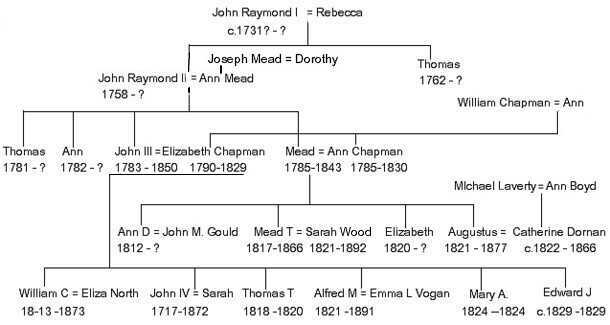 Mead Raymond, son of John Raymond and Ann Mead, christened 13 Nov 1785 1, 25 at St. Saviour's Church (since 1905 Southwark Cathedral), Southwark, Surrey, England; died aged 58 years July 1843 16 at Lower Road, Deptford 9, reg. Rotherhithe, buried 29 July 1843 St. Saviour's, Southwark 9. He married 12 Apr 1810 1, 17 in Saint Saviour's Church, Southwark, Surrey Ann Chapman, born 4 Aug 1785 and christened 28 Aug 1785 1 in Saint Olave, Southwark, Surrey, England; died in her 45 year Mar. 1830 aged at Christ Church, Southwark, Surrey, buried 6 Mar 1830 9 at St. Saviour's, Southwark, a daughter of William Chapman and Ann (surname unknown - possibly Terry). IGI parish record christening extractions list four children. The apprenticeship binding records of The Company of Watermen & Lightermen record that Mead was apprenticed as a lighterman to William Taylor as master on 29 May 1800 at St. Saviour's and completed the seven year apprenticeship on 16 Jul 1807. Two years after obtaining his freedom he became an employer in his own right when a Thomas Kingman was bound to him as an apprentice lighterman on 10 Aug 1809 at Bankside 2. When he was a witness in a case heard at the Old Bailey in 1819 concerning the theft of soap by an employee, Mead stated he and John Raymond were in partnership as wharfingers and lightermen (wharf owners or operators and the transporters of cargo to and from ships), and their counting-house was situated at Clink Street, Bankside (just west of London Bridge). London trade directory listings indicate by 1839 the John and Mead Raymond partnership had been dissolved and the two brothers were operating independent businesses. Supporting this conclusion is that when disposing of his real and personal property Mead's 1840 executed will mentioned only "his" business at Raymond's Wharf, Rotherhithe. The commercial section of the 1846 London Post Office Directory listed the two then independant firms as :- RAYMOND, MEAD & CO., boat & barge builders, wharfingers & lightermen, Raymond's Wharf, 50 Rotherhithe Street, and RAYMOND, JOHN & SON, lightermen, wharfingers & granary keepers, Horseshoe Sufferance Wharf, Clink Street, Southwark 14. The Barge & Boat Builders section of the 1852 London Commercial and General Directory carried no Mead Raymond & Co. listing indicating by then it was either no longer in that business or had been sold to another party and its name had changed. When Mead's younger son Augustus married in 1856 for the second time in Australia he gave his father's occupation as corn factor suggesting that had been Mead's main occupation. During the years of the partnership it may have been the case as a 1820 directory listing had the J & M Raymond partnership as "cornfactors and lightermen". Mead may have been the partner most involved with the corn merchant side of the business that in addition to the storage of grain at Clink street presumably involved buying from suppliers on the one hand, storage, and then selling and delivering to flour millers on the other, and perhaps with buying and selling on the London Corn Exchange, with elder brother John having concentrated on running the maritime operations. That such would have been John's main responsibility is suggested by him in 1840 having been the Master of the Company of Watermen and Lightermen. However it seems unlikely after the partnership with his brother John, that operated from the wharehouses, granary and wharf at Clink Street, was dissolved in the late 1830s Mead had an involvement with corn factoring. Between 1811 and 1835 there were Sun Fire Office insurance polices in Mead's name taken out for five properties viz: - in 1813 for 65, Hatfield St., and for St. Georges Road, for both again in 1821, for 32 Lower Stamford St., and Great Surrey St. in 1825, again for 32 Lower Stamford St. in 1833 and for 7 Cravan Place, Old Kent Road on 7 May 1834 18. Thus when the children were born Mead resided in Hatfield St. in Southwark, located off Stamford St. just west of Blackfriars Bridge, or in St. Georges Road. When he made his will in Feb 1840 he was still residing at Craven Place in the Old Kent Road where he would have moved ca. 1834 after seemingly having lived from ca. 1825 at 32 Lower Stamford Street. The 1841 England census taken in June 1841 listed his residence as Paradise street, Rotherhithe, and him as a lighterman aged 55, and that his household comprised son Augustus, an apprentice lighterman aged 19, daughters Elizabeth aged 21, and Ann Dorothy (Mrs. Gould), and two female domestic servants. Paradise Street was situated a mile east of Tower Bridge and one street back from the River Thames - today just off Jamaica Road near Cherry Garden Pier and the beginning of the Rotherhithe Tunnel 5 and a short stroll from where Raymond's Wharf was then located at 50 Rotherhithe Street. Paradise street was noted in 1826 described as - "an ancient road of distinguished large terraced houses". Today Rotherhithe is part of the Borough of Southwark and near the heart of Docklands. The name is believed to have Saxon origins - from rotha meaning mariner and hythe meaning landing place. For centuries its traditional industry was shipbuilding. Sir Francis Drake's Golden Hind set off from here. A minor mystery, that Mead's July 1843 death certificate might answer, is why the St. Saviour's Church burial register record gave his address as Lower Road, Deptford but two months later his Sept 1843 will probate gave it as Paradise Street, Rotherhithe - the same address he had at the 1841 census. Presumably the Deptford address was that of a hospital? Of the five Sarah, William and Mary have not been traced. Only Ann and Elizabeth were mentioned in William Chapman's 1815 will. That may indicate the others were deceased without leaving living issue or for another reason were not favoured. The marriage of William and Ann has not been identified. At the 2008 compilation date the only St. Olave marriages extracted to the IGI were post 1797 - however film of the earlier marriage registers is available. As both Ann and sister Elizabeth had a son baptised with the second given name of Terry it is possible Terry (or Terrey) was the maiden surname of their mother Ann or it had a genealogical significance from further back. As evidenced by several probated wills the Terry surname was present at Southwark from at least the 1600s. A perhaps relevant will was the Oct 1807 probated will of a John Terry a lighterman of St. John's parish. Ann Chapman was still alive when husband William died in 1816. With son-in-laws John and Mead Raymond and another she was an executor of his above linked to will that gave his occupation as carpenter and address as King Street, St. Saviours. It is thought he would have been the William Chapman, by occupation a cabinet maker, joiner, & venetian shade maker, who had an insurance policy dated 13 July 1808 with the Sun Fire Office in respect of premises at 56, King Street, Borough and was listed at that same address as a blind maker in the 1808 Post Office London directory 18. What was then King Street is today named Newcomen Street and forms the southern boundary of Guy's Hospital. It formed the southern boundary of St. Saviours parish and joined Borough High Street on its eastern side. Like many streets and alleys of Southwark it developed from an inn yard and was originally the yard of the Axe and later the Axe and Bottle. The street first became King in 1774 and in 1879 was renamed to Newcomen after Newcomen's Charity for boys and girls that had a presence in the street from the 17th century when the whole street came into the hands of two London charities - John Marshall's and Mrs. Newcomen's. With some minor exceptions the street has remained in their hands to the present day and the property that was numbered 56 remains in the hands of the trustees of the Marshall charity although today carries another number. The street still retains its 18th century contours and kerbside posts but it is not known if the house that was #56 before the renumbering has retained its basic 1815 fabric or has been completely replaced 26. Seemingly William was the William Chapman buried at St. Saviour's Church, Southwark on 5 Oct 1816 with his age given as 68 years and the place of death as Newington. Ann would definitely have been the Ann Chapman buried there a decade later on 6 Apr 1826 aged 78 years as her address at death was given in the register as Church Yard which was where her daughter Elizabeth lived 15. As when he made his will in March 1815 William lived in King Street very near St. George the Marytr Church it would normally be expected he would have been buried in its vault or churchyard. It appears the reason for the St. Saviour's burial may have been that when he died in 1816 the St. George's churchyard was closed to burials. In 1806, when it was said the annual death rate in the parish was 1,100, a survey of the church stated the vaults underneath it and the churchyard were nearly full. In 1816 an Act of Parliament was passed allowing the enlargement of the churchyard. Premises in several small courts north of the church and buildings were purchased and demolished and some land added that was previously in the adjoining Marshalsea Prison (the institution made famous by Charles Dickens in his book "Little Doritt"). In 1955 a tablet standing in the east part of the churchyard, dating from the time of the extension, read the wall to which it was attached was built in 1817 32. On the other hand the marriages of daughters Ann and Elizabeth at St. Saviour's in 1810 and 1811 indicate an affiliation with that church and accordingly may have been the reason for his burial there instead of at St. George the Martyr. William's parentage can presently only be speculated upon. The current in 2008 IGI listed a William Chapman baptised at St. Saviour's on 5 Oct 1759 without parent names given. However their names were readable in the original register at the LMA as Joseph and Sarah with his difficult to read occupation perhaps being a chairmaker 28. However to be the William who died in 1816 he would have been aged 56 at death instead of the 68 given in the register! Basis the thirteen year discepancy, and the likelyhood that when aged 20 he would not have married an about 10 years older than him Ann, he has been excluded from having been 1816 buried William. A more likely candidate for William, despite a four years difference between the baptism and 1816 burial register age, is the William Chapman, son of Thomas and Mary, who was baptised 21 Oct 1744 at St. Olave, Southwark (thus aged 71 or 72 in 1816) who had three siblings also baptised at St. Olave viz. - Elizabeth 1735, Thomas 1749 and Joseph 1751 7. For a full analysis of why the latter Oct. 1844 baptised William and 1816 buried William are thought likely the same person see burial notes. The records indicate the era of this Raymond family as lightermen on the river Thames may have begun as early as 1745 when ca. 1731 born John Raymond was apprenticed and that it expended to at least 1866. However the lightermen apprenticeship bindings indexes and birth affidavit proofs list others with the Raymond surname, of whom it is possible some were of unidentified branches of the same family. If so it may extend the years of the family as lightermen on the Thames to and beyond 1883 when a 1859 baptised Henry Albert Raymond is recorded as having taken on a lighterman apprentice 31. In the vastly changed London of the second millennium little remains of the buildings that once were near the Thames at Southwark excepting Southwark Cathedral - formerly St. Saviours Church. In its adjoining small church yard, or perhaps more likely under the main church floor in the Great Vault in caskets encased with lead, or optionally so encased in what was known as the Bishop's Vault that ran underneath the church yard and to which entry was gained though the Lady Chapel, were laid to rest John and his brother Mead and their Chapman sister wives and some of their children who died whilst young. If interred in either vault, as was sometimes the space saving practice with members of the same family, perhaps they rest with coffins stacked one upon another and held together by chains. 8. William Chapman Raymond, born 1813 in Southwark, London, England, baptised 29 Apr 1814 25 in Christ Church, Southwark. He died aged 60 in Dec. Qtr. 1873 reg. Marylebone. He married reg. Kensington in Sep. Qtr. 1845, Eliza North, born St. Johns Wood, Middlesex. Follow the link for a separate page with details of his history and descendants. 9. John Raymond IV , christened 16 Jul 1817 1 at Christ Church, Southwark, London, England; died aged 55 years in Dec. Qtr. 1872 registered Wandsworth, Surrey (Dec. Qtr. 1872, Vol. 1d, p. 305). He married ca. 1843 Sarah (surname unknown), b. 1823 Marylebone, Middlesex. His marriage has not been identified in the indexes. 10. Thomas Terry Raymond, baptised 30 Dec 1818 1 at Christ Church, Southwark, son of John and Elizabeth; died Nov. 1820 at Green Dragon Court, Southwark; buried 11 Nov. 1820 9 at St. Saviour's, Southwark. 11. Alfred Mead Raymond, born 9 Jul 1821 1, Chr. 1 Jan 1822 1 at St. Saviour's Church, Southwark, Surrey, England; died aged 70 years on 8 Apr 1891. He married in Lee Church, Lee, on 14 June 1849, Emma Louisa Vogan, born ca. 1828; died 1878 reg. Hastings, youngest daughter of James Vogan of Lee. Follow the link for a separate page with details of his history and descendants. 12. Mary Ann Rebecca Raymond, born 23 May 1824 1; Chr. 18 Aug 1824 1 at St. Saviour's Church, Southwark, Surrey, England; died 28 Jun 1825 1. No doubt her Rebecca came from her grandmother's name of Rebecca. 13. Edward Joseph Raymond, born ca. 1828, christened 24 Feb 1829 1 at St. Saviour's Church, Southwark, Surrey, England; died March 1829, buried 28 Mar 1829 9 at St. Saviour's, Southwark. Edward's mother died on 27 Jan 1829 four weeks before he was christened. The burial register did not have his age as "infant" to indicate he was less than one year old but had it as one year indicating a birth before 29 March 1828. 14. Ann Dorothy Raymond, born 22 Sep 1812 1, Chr. 2 Apr 1813 at St. Saviour's Church, Southwark, Surrey, England; died aged 80 years Sep. Qtr. 1893 reg. Camberwell (v.1d, p.561). She married 21 Jul 1832 when still a minor with her father's consent, at Christ Church, Blackfriars, Southwark, Surrey, John Morton Gould 20. Her given names would have been dervied from that of her mother Ann Chapman, grandmother Ann Mead and great-grandmother Dorothy Mead. The banns for her marriage to John Gould were read as required on three successive Sundays from 17 Apr to 1 May 1831 at St. Mary, Whitechapel. However a marginal note in the church record of the banns read "stopped by the father of the woman she being under age" indicating her father Mead interceded to stop the marriage by banns proceeding. However he must have later relented as she was married by licence at Christ Church, Blackfriars, Southwark on 21 July 1832 with several family members recorded in the register as witnesses including on her husband's side William Ellis Gould and Sarah Gould, and as recorded in the register, she married "with the consent of Mead Raymond the natural and lawful father of the said minor". At the time of the marriage the address of her husband was given as - Great Saint Helen Bishopgate within the City of London. She was listed at the 1841 census as a married woman, aged 28, residing in her father's Rotherhithe household. That at least eight years after her marriage she was residing with her father and apparently without any children and with her husband absent suggests she may have been a deserted wife or had separated from her husband. All subsequent census listings are consistent with this supposition. Due to ambiguities there is a slight doubt as to her identification at the 1851 census. It is thought she would have been the Anne D Gould, a married person, aged 37, with her occupation given as artist, living with an unmarried sister Elizabeth Maynyard (sic) in Peckham, Camberwell with one female domestic servant 30. In 1861 she was again listed as Anne D Gould, a married person, with unmarried sister Elizabeth Raymond then residing at #22 Clifton Grove, The Crescent, Peckham, Camberwell - both born Blackfriars, Surrey. Ann's age at 40 was eight years understated and Elizabeth's at 30 years ten years understated. Their occupations were given as retired. In 1871 Ann was just listed as Ann Gould, aged 58, and the two sisters were at 22 Clifton Crescent, Peckham, which would have been the same address as in 1861, and their household had one female domestic servant. Ann's status was given as widow indicating between 1861 and 1871 she must have learnt her husband John Morton Gould was deceased - she would have had a dower right to part of his estate. In 1881 the two were listed with the just the initials (A. D. & E) for their given names with Ann's age at 65 being three years understated. Also in the household was a 61 year old lodger John Richard a civil engineer. The address was 65 Clifton Crescent in Peckham, Camberwell. Allowing for a renumbering of allotments it may have been the same address in the street where they resided at the 1861 and 1871 census. By the time of the 1891 census the two sisters appear to have either parted company or Elizabeth was deceased. Ann Dorothy's Sep. Qtr. 1893 death was registered at Camberwell and at the April 1891 census she appears to have been the Ann Gould listed as aged 74, with her birth place given as Blackfriars, Surrey, who was at #8, Leyton Square, Peckham, Camberwell residing with a John Burns and his wife and family or next door at #9 with a Cornelius Fairbrass and his wife. 15. Mead Terry Raymond, Chr. 16 Jul 1817 1 at Christ Church, Southwark, London, England; died Sep. Qtr. 1866 aged 49, reg. Isle of Wight. He married in Dec. Qtr. 1839 reg. Islington, Sarah Wood, b. 1821 at St. Andrew, Holborn, died aged 71 years in 1892 reg. Croydon, daughter of Thomas and Mary Wood. Follow the link in this paragraph for a separate page with details of his history and descendants. 16. Elizabeth Raymond, Chr. 7 Jun 1820 1 at Christ Church, Southwark, London, England. She was listed residing with her sister of Ann Dorothy Gould in Peckham, Camberwell at the 1851, 1861, 1871 and 1881 census - at each without an occupation given. She and Ann appear to have ceased residing together some time post 1881, and whilst it is seems likely Elizabeth remained living in the Camberwell area, she has not been identified in the 1891 census indexes. At the 1901 census it is possible she was the Elizabeth Raymond, aged 78, single, with her birth place listed as "NK" for not known, who was residing as a lodger in the household of tailor Daniel Roos and his wife Pauline at #160 Commercial Road in Peckham, Camberwell. At the date of this compilation in 2008 the available death indexes are neither completely accurate or comprehensive and new and better official indexes are not expected until mid 2011. The available indexes suggest that post her 1881 census listing only three registered Elizabeth Raymond deaths could have been her viz:- (1) Jun Qtr. 1883 reg. Liverpool aged 64 years (so born ca. 1818), (2) Mar. Qtr. 1902 reg. Bath aged 81 years (so born ca. 1820), (3) Dec. Qtr. 1917 reg. Henley aged 98 years (so born ca. 1819). Although a Camberwell or a nearby area death registration would be expected the 1902 registration at Bath in County Somerset (165 kls west of London) is the closest match to her likely 1820 birth year. 17. Augustus Raymond, Chr. 4 Jan 1822 1 at Christ Church, Southwark, London, England; died 18 Jan 1877 in Sydney, New South Wales, Australia. He married firstly in 1849 in England and twice more in Australia in 1856 and 1867 to which he emigrated in the 1850s. Follow the link in this paragraph for a separate web page with details of his history and descendants. 1 LDS Church International Genealogical Index (IGI). 3 Email advice dated 11 Dec 2007 from Steven Freeth, Manuscript Librarian, Guildhall Library, London - giving christening date and the church or date of birth and the place, for some Raymond surname apprentice lightermen as extracted from the Company of Waterman & Lighterman apprentice birth proof affidavit records. 4 St. Olave's was a small church, situated beside the London Bridge on the eastern, Bermondsey side of High Street that survived on the edge of the river until demolished in the 1920s. 5 9 Sep 2007 email from Neil Rhind MBE FSA of England, architectural historian - advising 1841 England census data for the Mead Raymond household & 1 Oct 2007 email advising extensive directory listings for Raymond and Vogan family businesses from 1811 to 1855. 6 Pallot's Marriage Index 1780-1837. 9 Burial Register of St. Saviour's Church, Southwark - transcription by John Hanson and Monica Stevens. 10 The Times of London, 28 Jan 1829, p. 4., col C. DIED - On 27th Inst. Mrs. Elizabeth Raymond, wife of Mr. John Raymond, of St. Saviours', Southwark. 11 Pallot's Marriage Index 1780-1837 - John Raymond (St. Michael ...hill, City of London) marr. by license Elizabeth Chapman (a minor) with consent of father Wm Chapman at St Saviours 1811. 12 The A2A database catalogue of the Guildhall Library - index to the policy registers of the Sun Fire Office from 1811-1834 - search string used "Raymond's Granary". 13 The Times of London, 29 March (col 3) & 8 April (col 4) 1823 - premises offered for sale by the Executors of the Estate of the late John Evans. 14 The June Edition of the Post Office London Directory 1846 (W. Kelly & Co 1846 - 1994 Facsimile Edition). 16 St. Catherine's House Death Index Sep. Qtr. 1843 Vol. 4, page 250. 17 Pallot's Marriage Index 1780-1837 - Mead Raymond (St. John in Borough of Southwark) marr. Ann Chapman by licence St. Saviour 1810. 18 Sun Life Office policy holders listed in the A2A database catalogue of the Guildhall Library. 20 Pallot's Marriage Index 1780-1837 - Ann Dorothy, a minor, marr. with father Mead's consent John Morton Gould (St. Helen Bishopgate within City of London) at Christ Church, Blackfriars - indexed year on the card indistinct & unreadable. 21 National Archives 1851 census of England index. 3. Hannah Gatland - wife of William RAYMOND of St. Saviour's, Southwark, Co. Surrey, dyer. 4. Elizabeth Gatland - wife of Clement HART of St. Albans, Wood Street, Co. Middlesex, stone cutter. 5. Carolina Gatland - (deceased) wife of Edmund BANNESTER, of St. Saviours, Southwark, Co. Surrey, "vittler to Richard Burt". Re Cuckfield - The returns of the Bishop’s Commission for 1724 gave the number of families in Cuckfield as about 270. IGI extractions indicate the Gatlands' were in Cuckfield from at least the late 1500s when an Edward Gatland was baptised at Holy Trinity, that Hannah's parents Edward Gatland and Hannah Wheeler married in 1687, that Hannah was baptised 1689, and that her father Edward died in 1710. In 1761 the first direct road from Cuckfield to London was made - re-routing the road to Brighton though Cuckfield. The rail lines passes within abt. 2 kilometers of Cuckfield. Holy Trinity church at Cuckfield is over 900 years old and its burial ground has surviving headstones from the 18th century. 23 A2A database - LMA holdings of Southwark Bridge Company deeds relating to leasehold property. 24 Wills to 1858 held by the National Archives. 25 Saint Saviour, Southwark, Borough High Street - Register of Baptisms - John 1783 and Mead 1785 baptism parent names and father's occupation extracted and provided courtesy of Judy Lester (email 22 Jan 2008). John Raymond I 1731 and Ann 1733 parent names etc. extracted from the St. George in the East, Stepney, baptism register & John Raymond II b. 1758, Thomas Raymond b. 1762, & Thomas Raymond b.1781 baptism parent names and father's occupation from the original St. Saviour's registers at the LMA, and Guildhall Library held lighterman apprentice birth proof affidavit details for six Raymonds' - all ascertained and provided courtesy of Judy Lester (email 16 Feb 2008). 26 History of Newcomen Street (formerly King Street). 28 St. George the Martyr church burial register checked for Chapman burials & the St. Saviour's baptism register 5 Oct 1759 William Chapman entry details ascertained and advised by Judy Lester - who advised that whilst the occupation of his father Joseph was defintely Ch***maker 100% certainty was not possible but is to be assumed basis Southwark and Bermondsey were well known for chairmaking. 29 In 2008 the British Origins subscription website had indexes/abstracts of pre-1858 Archdeaconry Court of Surrey wills (not consulted). In 2008 the London Metropolitan Archives (LMA) online index to Consistory Court of the Diocese of London wills and administrations had some Surrey wills but none for any Surrey resident RAYMOND. 30 1851 census listing had her sister's name as Elizabeth Maynyard (instead of Raymond) aged 31 years (age was correct as Elizabeth was born in the first part of 1820 so would have been 31 next birthday at time of the 1851 census). The other ambiguity was that the birth place of both sisters was given as Christchurch "Blk f" (thought to be the abbreviation for their correct birth place of Blackfrairs - with Christ Church, Blackfriars being where Elizabeth was christened), County Middlesex (incorrect as the correct county was Surrey). It is assumed that for some reason Elizabeth (or Ann if she was the informant) must have given an incorrect surname for Elizabeth to the enumerator or there was some mix up. 31 The apprenticeship bindings indexes and affidavit birth proofs list a John William Raymond, born 27 Oct 1829 and baptised at St Dunstan Stepney, who began a lighterman apprenticeship at Ratcliff on 8 Dec 1842 & completed it on 14 Feb 1850, who was aprenticed to a John Raymond as master who was seemingly the John Raymond born 23 Apr 1800 and baptised 14 May 1800 at St. George, Middlesex, who in turn had been apprenticed a Richard Wilson on 22 Dec 1814 at St. George East and had completed his apprenticeship on 7 Feb 1822. Two presumed sons of 1829 born John William - John William born 11 Nov 1851 and baptised at St John of Wapping, and Henry Albert born 23 Apr 1859 and baptised at St Paul, Shadwell, began apprenticeships respectively at Wapping and Ratcliff 1867 and 1875 under John William as master and completed them in 1875 and 1880. They were possibly another line of this same Raymond family. Henry Albert Raymond is recorded as in 1883 having taken on a lighterman apprentice 2. 32 From: 'The Church of St George the Martyr', Survey of London: volume 25: St George's Fields (The parishes of St. George the Martyr Southwark and St. Mary Newington) (1955), pp. 26-38. See: http://www.british-history.ac.uk/report.aspx?compid=65442.